"The loops in the switcher have 8 pedals (1 per loop). 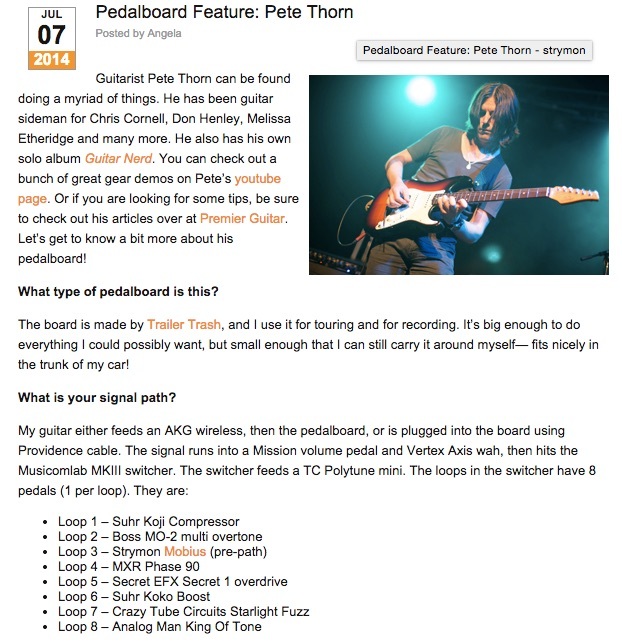 They are: Loop 1 – Suhr Koji Compressor…" [Pete Thorn](http://www.strymon.net/2014/07/07/waiting-pictures-pedalboard-feature-pete-thorn/). On his pedalboard from 2016. In photo provided by Tim Grime, it is revealed that Haug used Suhr Koji Comp. On September 29, 2016, Mateus posted in his Instagram some information about his pedalboard. The Suhr Koji Comp is among his pedalboard number 2. COMP: This control determines the amount of compression (gain reduction) applied to your signal path. LEVEL: Adjusts the overall output level of the Koji Comp. Use this control to compensate for the amount of Compression/Gain Reduction applied to your signal path. ATTACK: Determines how quickly the compressor responds to signals above a desired threshold. MIX: Varies the ratio of dry to compressed signal from 10% – 100%. VOICE SWITCH: This switch offers the following three voicings. Just got this one having spent a good bit of time researching decent, flexible compressors for a wide range of uses. Incredibly versatile with 9v and 18v power options for those wanting a bit more headroom. This is a quality compressor effect pedal. Some pump and disappoint, but not the Suhr.